...also called the mini Ranger. Gearbest.com sent this plane to me for review. It's a 1.4m wingspan pusher style motor glider marketed as an FPV platform. It's ready to fly and includes transmitter, battery and charger. Although the build quality and hardware are quite good, the flight performance out of the box is far from perfect. High mounted pusher motors tend to push the nose down when power is applied. Some down thrust must be designed into the motor mount to counteract this, and there is not enough in this plane. 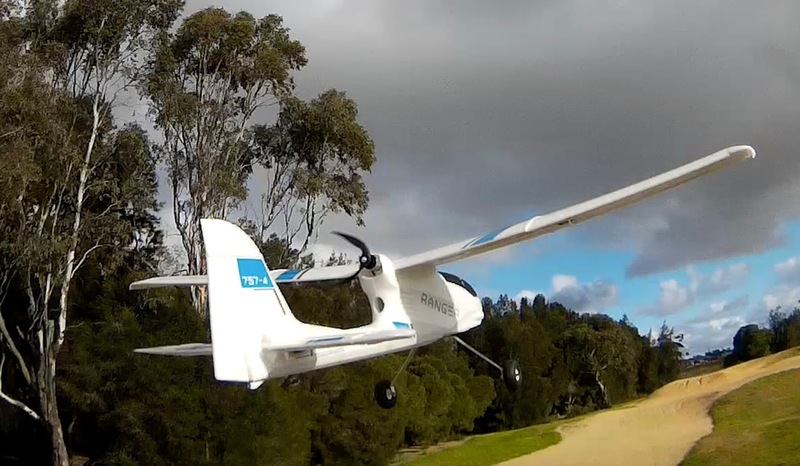 The result is that the mini Ranger dives down under power and loops up when the throttle is cut, making it impossible to maintain level flight. That's easy to fix. Just need to add 1.5mm thickness spacers under the bottom motor mount holes to angle the motor up a bit at the back. Another major problem is the ineffective vertical stabiliser. The airflow over the rudder is blanketed by the big chunky fuselage causing bad adverse yaw. This means that the mini Ranger struggles to turn. When you use ailerons to bank into a turn the plane wants to head in the opposite direction. More rudder and power input is required to force it through a turn. You need to use lots of rudder and aileron input all the time, or you can mix the rudder and aileron in the transmitter programming. Here are build and maiden videos, as well as post maiden mods and adverse yaw explained. I didn't enjoy flying this plane in it's original configuration so the next post will show how I converted it into a tractor motor, short takeoff bush plane, much like the HobbyKing Tundra.